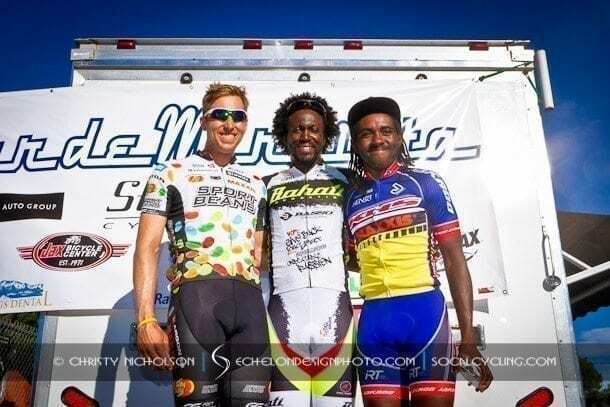 Watch the finish of the Tour de Murrieta Pro 1/2 Men’s Circuit Race as Rahsaan Bahati (Bahati-WTR) sprints for the victory. Cory Williams (KHS – Maxxis) took 2nd, followed by Sean Mazich in 3rd (Jelly Belly pb Maxxis). Check back soon to SoCalCycling.com for a photo gallery from the Circuit Race. Above Photo – Men’s Podium: 1st Rahsaan Bahati (Bahati-WTR), 2nd Corey Williams (KHS – Maxxis), 3rd Sean Mazich (Jelly Belly pb Maxxis).